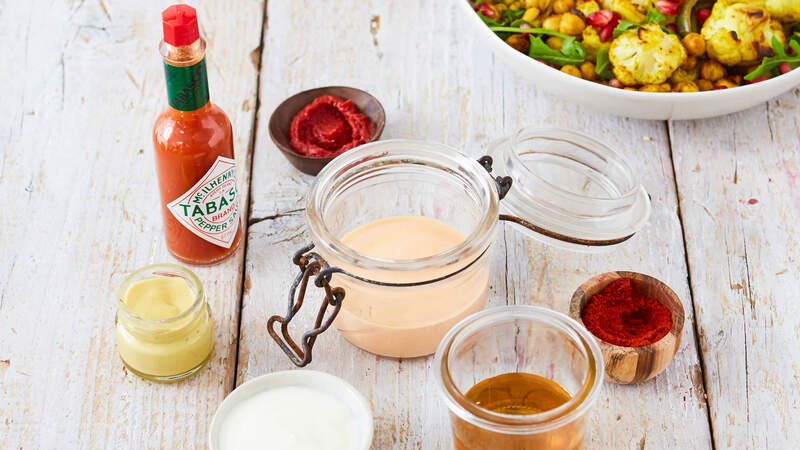 For the yogurt dressing simply add all the ingredients to a jar including a pinch of salt and pepper and shake well to combine. You can ramp up the heat with a few extra drops of TABASCO® Sauce. For the pickling liquid, combine the white wine vinegar, agave or honey, water, and TABASCO® Sauce in a small saucepan and warm gently. Spiralize the carrots, or use a vegetable peeler to create ribbons. Alternatively, halve and finely slice lengthways. Place the carrot in a jar and add the warm pickling liquid straight from the pan. These pickled carrots will keep in the fridge for up to two weeks. Preheat the oven to 410°F and line a large baking tray with baking parchment or greaseproof paper. Chop the cauliflower into even sized florettes, drain the chickpeas and pat dry on kitchen roll as much as possible, peel and cut the red onion into thin segments, and add all to the bowl. In a dry frying pan toast the cumin seeds, coriander seeds and fennel seeds on a medium heat for two minutes, or until you can start to smell the toasted aroma. Add the curry powder for the last 30 seconds. Grind the toasted seeds in a pestle and mortar or blitz in a food processor. Add the toasted seeds to the cauliflower, chickpeas and onion along with the olive oil and honey. Mix everything until fully combined. Tip everything onto the lined baking tray and spread evenly. Roast in the pre-heated oven for 14 minutes, opening once during roasting to let any steam out. This salad is best served warm rather than hot, so allow it to cool for 10 minutes before tossing with rocket and pickled carrots and piling high on a serving dish, scattering with pomegranate seeds and serving the spicy yogurt dressing on the side. This dish can be prepared in advance, ready to be roasted half an hour prior to serving. Scatter over the pomegranate seeds along with flaked almonds to add flavor and texture. Here’s a tip for removing pomegranate seeds from the fruit: halve the pomegranate and place flat side down in your palm. Hit with the back of a spoon to release the seeds.